“Trade shows are high content, two to four day events requiring attendees and exhibitors to skillfully prioritize their face-to-face networking. Business negotiations are difficult to close during the show. Initiating new business contacts for negotiation after the show is often impossible. There are eight 360º panoramas keyed to a floor plan and each is populated with links that ultimately feature 27 products thru interactive media. There is a further layer of linking that enables the viewer to examine all the marketing brochures and videos to the 27 products, as well as the ability to order product from this site. We shot the panoramas the night before the show opened and delivered the finished work to SONY an hour and a half before show opening. 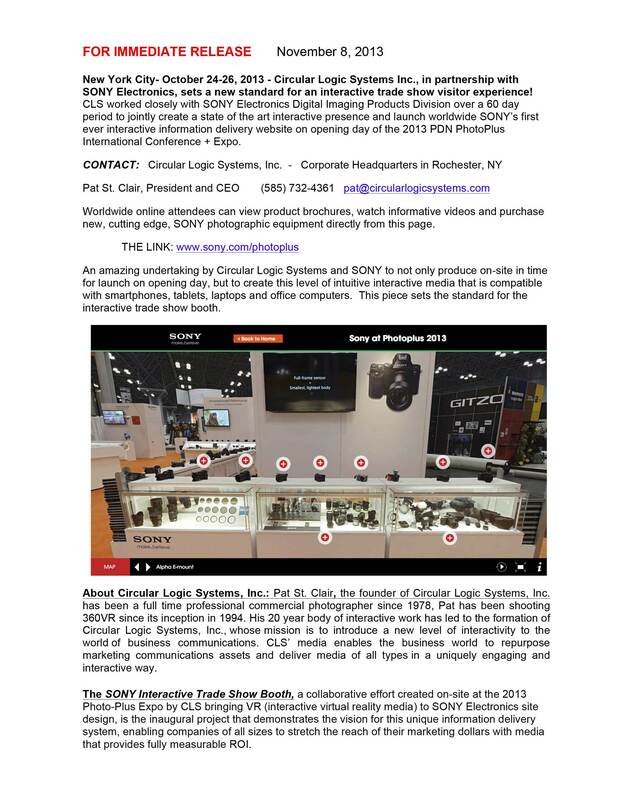 This enabled SONY to launch worldwide same time as the actual brick ‘n mortar trade show opened, thus reaching a worldwide audience instead of only the 25,000 show attendees. This was a first! By having this online version of their booth, SONY extends the networking opportunity from this show for a full year! With the proper use of metric analytics, the further opportunity exists to fully gather marketing data during that year, thus obtaining a solid measurement of ROI. And finally, for the first time, this show runs on all internet enabled devices . . . all smart phones, all tablets, and all operating systems. DEMO PIECE ON THE TRADE SHOW FLOOR AT THE 2010 ARNOLD SPORTS FESTIVAL. This standard package is a single 360º shot at peak crowd time with identifying graphics, your logo (linked to your web site), and one additional link. In this case the additional link takes you to the GNC Store Locator so the viewer can find the closest store to buy GNC products.